"This trip has been so amazing. I don't have the words to describe it all. Havasu, all the rapids on day 3, the Little Colorado, and all the great company. The guides were complete pros. They made the worst rapids look easy. This trip has truly inspired me. It has reminded me of all my old passions." -- David H.
"Someone said it's time to get back to the 'real world'. I realized on this trip that this (Grand Canyon and the outdoor world) is the real world. What we do in our everyday lives is we create each day as we hurry to accomplish some set of tasks. Thanks to the whole crew for helping me better understand that I might need to modify my priorities. You guys 'Live the Dream'." -- Mike A. "The Grand Canyon and all canyons on the Colorado Plateau have been a part of my life for over twenty years -- hiking, climbing, canyoneering, and going down this magnificent rio twice now. I love this place and it will always be a part of who I am. Canyoneers has give me a well guided, safe and fulfilling run through this great gorge and to them for that I am grateful! May there always be more canyon trips to come." -- Chris M.
"Our families have talked about this trip for years and the time came in 2012. This experience and personal challenge began as an idea and vacation trip, but has clearly changed us all far greater than the depths of this treasured canyon! We were once apprehensive about a 7 day trip and now wish it could have been 17 or 27 days -- every single minute and view on the river was unbelievable natural glory. Jamie, Kolby, Jacob, and Ethan were a fantastic crew and clearly expanded our experience with education and friendships! Thanks to Canyoneers for a life experience!" -- Tuck B. "What an amazing adventure. So much fun, laughing until my stomach hurt. Best boat. Loved all four guides. Fabulous food. You guys are a wealth of info, true or not it doesn't matter -- great stories. Thank you so much!" Jeanette B. "Knowledgeable, patient, caring, kind, hard working -- that's how I would describe each of the men who kept us safe on the river -- Kolby, Jamie, Jake, and Ethan. This trip has been an adventure that only those of us who have experienced it firsthand can truly appreciate. I loved every minute of it. Thanks guys!" -- Jeanna S.
"Having lived in Arizona for the vast majority of my life I have always wanted to raft the Canyon. I've had a great time with my family, friends (new and old), and this exceptional crew. Hard to imagine how it could be any better. I'm sure my kids will remember this for the rest of their lives and I appreciate you guys getting us to the end comfortably and safely!" -- Steve S.
"Well, a trip of a lifetime and impossible to express in a few words. Fun, knowledgeable, and helpful guides and a new beautiful sight every minute. When I think about returning to reality, I realize this past week was reality. A week full of reflection, solitude, camaraderie, and new personal experiences. My second Canyoneers trip -- thanks so much to Jamie, Jake, Kolby, and Ethan!" -- Mike C.
"After living in Arizona since 1999, it has been amazing to finally see the Canyon from the river. A large part of this wonderful experience has been our really fun, always ready to please guides and pilots. The food, rapids, and the entire experience surpassed any expectations I had. I also camped for the first time ever and conquered many fears. Thank you Kolby, Jamie, Ethan, and Jake for making our week unforgettable" -- Ranie C.
"This trip has been an amazing week full of fun and adventure. It was way more fun than I ever imagined and absolutely loved it. Thank you for all your time and dedication you put into this great canyon so that we could experience and enjoy it! The food was amazing and you all are hilarious. 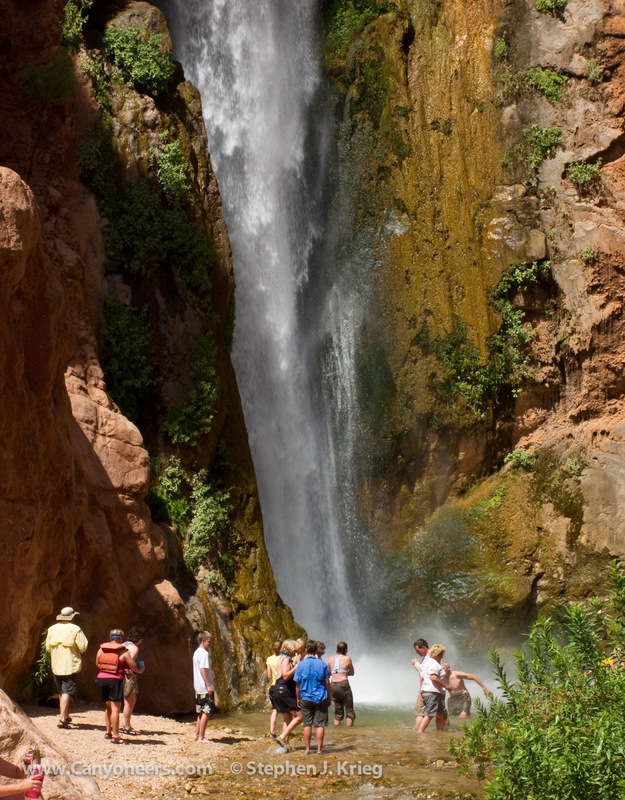 I would recommend this trip to anyone and couldn't have asked for a great tour of the Canyon." -- Siah L.
"I completely agree with the person who said we could be in the back of a pickup truck in the middle of nowhere with you guys and it would still be fun." -- Andrew S.
This post was contributed by Steve Krieg.